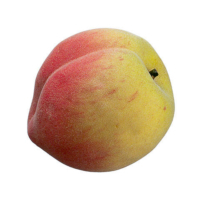 Our artificial peach is very realistic with surfaced skin and natural looking colors. It can add some natural taste to dining tables. It is perfect for various displays of artificial fruit. Thus, you can use our peaches anywhere you want to like your kitchen, your home or dining area. Only the most real looking fake fruits make it to Amazing Produce. In fact, we have other artificial fruits as well that look very realistic including bananas, grapes, apples, limes, strawberries lemons, and many more. The faux peaches on our site are among the best artificial fruits available to display in your fruit stand or kitchen. No other site compares to our collection of such awesome looking artificial fruit. Consequently, at Amazing Produce you get realistic looking peaches for any decorating display.